A orbital clock for Jupitors moons. Will show you exactly where they are in relationship to each other at any time. binoculars, or just the naked eye. each of Jupiter's four largest moons. And just for comparison, here's the same data for our moon. relation to Jupiter itself at a given date and time. there are some restrictions as to what dates you may enter. time is to just enter the letter "D" (upper or lower case). will be prompted before the program returns you to DOS. number of hours before or after Universal Coordinated Time. and a few other locations around the world. abbreviation appear or don't know what the abbreviation is. Now on to the Orbital Clock! appears, negative for the left side and positive for the right side. again will toggle the Orbital Clock off into the frozen state. in motion or in the frozen state. only appear if you request it. within this date that corresponds to the time of day you specified. matching the view in a telescope. 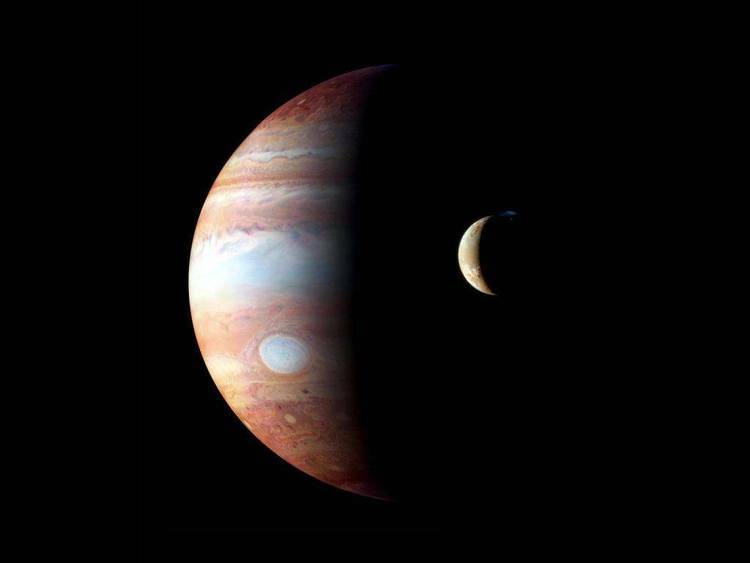 the moon, from our view point on Earth, is passing behind Jupiter. and indicates that the moon is passing in front of Jupiter. pressing the "H" key on your computer keyboard. front of or behind Jupiter is the Bi-Dimensional Orbital Display. "G" = 15 Day Orbital Graph. "H" = 3 Day Orbital Graph. "S" = Sets the Orbital Clock in motion or freezes it. "U" = Updates the Orbital Clock. "X" = Exits the program and returns you to DOS. "Z" = Allows change in Date, Time, and Time Zone. considerable amount of time to complete. Bi-Dimensional Display are a little difficult to separate. a general list of when Jupiter is in the sky through 1989. Key: r = Jupiter rises in the East during twilight. R = Jupiter rises in the East after twilight. t = Jupiter transits during twilight. T = Jupiter transits after twilight. s = Jupiter sets in the West during twilight. S = Jupiter sets in the West after twilight. Sennitt, Andrew G. 1988. World Radio TV Handbook. 1988 Edition. Amsterdam, The Netherlands: Billboard A. G.
Programs. Radio Shack Book # 62-2313.